There’s nothing like a bit of retail therapy to lift one’s spirits and North Carolina is loaded with outlet centers for just about anything you’re looking for. Some of the best are right here in the Piedmont, offering everything from clothing to home goods - and more. 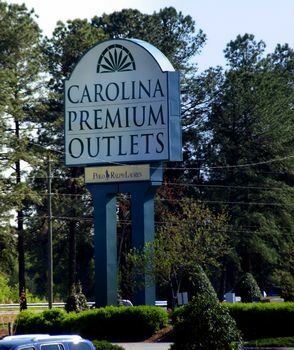 The Carolina Premium Outlets (Chelsea Premium Outlets) shopping center is located just off I-95 in Smithfield, about 35 miles southeast of Raleigh. There are more than 80 outlets featuring upscale stores like Coach, Brooks Brothers, Banana Republic, Liz Claiborne, Carolina Pottery, Gap, Eddie Bauer - to name a few. Many of the stores have promotions and shopping events throughout the year. An added bonus for shoppers age 50 and older is a 10% discount on purchases every Tuesday from participating shops and restaurants in the Outlets center. In addition to shopping, there are many things to do and see in this part of the state that can easily extend your day excursion to a great overnight or weekend trip. While you're in the area, be sure to also check out the Ava Gardner Museum in Downtown Smithfield, and the nearby town of Selma where antiques, history, and Branson-style music can be found. Close access to I-95 and US-70 means there are plenty of accommodations and restaurants nearby. Carolina Premium Outlets are located at 1025 Industrial Drive, Suite 905, Smithfield, NC 27577. The shops are wheelchair accessible and accessible parking is available.